Soft, beautiful and super comfy set. Get in style with the NEW Truly Soft Pinch Pleat bed in a bag. This item features super soft, brushed polyester, pleated for a lofty, luxurious look. Each comforter set comes with a printed sheet set. Sheet set is also constructed with a soft, durable, brushed microfiber polyester which is easy to care for and perfect for year round use. Dimensions 23.0 In. X 21.0 In. X 15.0 In. Gorgeous! I bought this for my 5 year old niece's room at our house that we use as a guest room as well and it is beautiful and so soft! The sheets that came with it are great too! So happy for this purchase! I highly recommend this set! 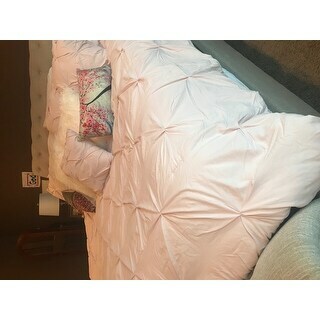 (In the picture posted I don't have the sheets that came with it on the bed as they are in the washing machine but wanted to post a picture of the beautiful comforter). We also bought this platform bed via Overstock as well and love it! I was extremely happy with this bed in a bag set! I love the design of the comforter. Plus it is so soft & cozy. The sheets are great! The deep pockets make it easy to put on my mattress. Plus the pattern on the sheets are nice since most of my sheet sets are solid colors. I bought a queen size in pink. It came with 1 accent pillow which just adds to how the bed looks after putting the set on my bed. Definitely would order again! This bedding set is fantastic!! I purchased the pink set and the color is beautiful!! The comforter is extremely soft and comfy!!! Truly just makes it very hard to get out of your bed!!! I loved it so my I purchased it for a family member also!! 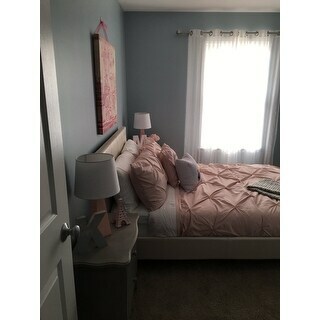 This set is great quality plus so soft I have an high mattress 17 in sheet fit fantastic and the whole look from sheets / shams to comforter and cute deco pillow too The pink color is pale pink looks great with the the grey and white accents in my bedroom.. Very cute, not sure how long the "fluff" will hold up. My daughter did not want a duvet cover and most this style were duvet. The price was great, so I figured it is worth it! This set is super cute and a good quality for the price. The sheets are soft and do not feel super cheap. The comforter is heavy enough but not too heavy for the summer. Love the designs in the sheets and the pleats in the comforter and shams. Soft, cute, and looks like the picture. I was sent the wrong color but the one I received was still very pretty. The sheets are soft and kind of trendy, I love the look of them. We have a king size bed and i did not use the shams but the pillow set that came with the sheets work nicely too. These, bed sheets and comforter are amazing. When I saw the pictures of them, I knew that I wanted them because they looked cute. The price was good and the reviews were really good, so I bought it. Now I’ve had it for over 2 months and it is still in good condition. The sheets are soft and comfy and so are the comforter and the pillowcases. This is a very pretty comforter! I was happy that the fitted sheet fit my bed because most don’t. It does have a weird smell to it though, I’m assuming where it’s been in plastic. Still would recommend. Comforter was practically falling apart when I opened it. Thread was everywhere. Also the comforter was made of a really cheap material. The actual style and color of the comforter is just as described just wish it was in better shape. Also I ordered a full/queen and the size was more like a queen. I was way to big for my full size bed. Overall I do not recommend this comforter. Great value and a beautiful pale pink. Just wish the comfortor was softer. Comforter soft, great color, warm, ample loft, appears good quality. Thirteen year old daughter loves it and has absolutely no complaints -- in fact, I have a hard time getting her out of bed in the mornings! This was suppose to be the last piece to my new bedroom setup, unfortunately this material is very thin and cheaply made. I would pick this for a main bedroom but maybe a guest room which the reason of two stars. I’m hoping I can find a better comforter on overstock . "The description shows 8 pieces but I can't figure out what that includes for the twin XL. Is that a mistake or am I overlooking something?" I love how beautiful the set is. Includes shams and sheets. Have been looking all over for a bedding like this! Perfect. "I'm wondering if the lighting is making it look a lot lighter? I know blush it's my favorite color but this looks lighter than blush. I'm looking at the pink flowers on the table and comparing. I've also seen other sets that r blush and they don't look as light. I may take the chance and order and just return. Great deal. " The blush color is a soft, light pink. It is true to the image. For reference, it is pantone # 13-1504TCX. Blush is a light pink color.